The facility, situated at the library, will provide a state-of-the-art research environment for postgraduate students. According to Prof Marilyn Setlalentoa, the campus’ deputy vice-chancellor for operations, the Research Commons will provide a conducive environment for researchers. The Research Commons has sitting space for 34 honours, and 64 master’s and doctoral students. 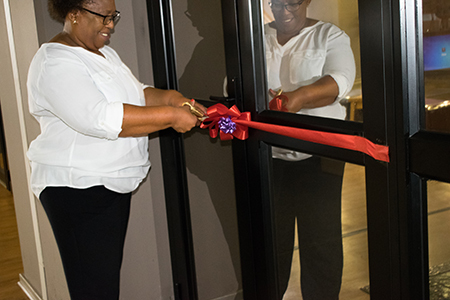 Prof Marilyn Setlalentoa cuts the ribbon signalling the official opening of the facility. 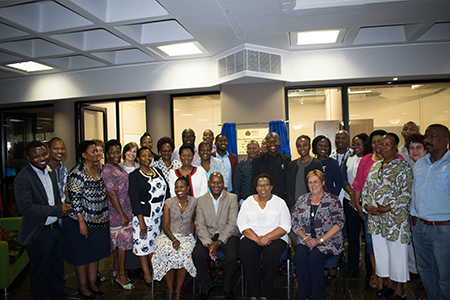 Dr Matthew Moyo and Prof Setlalentoa (second and third from the left) are joined by library and other NWU staff, as well as the Student Campus Council’s deputy chairperson, Sibusiso Digoro.